WHEN: September 10, 2014 at 7 p.m. Brazilian time (6 p.m. EDT). 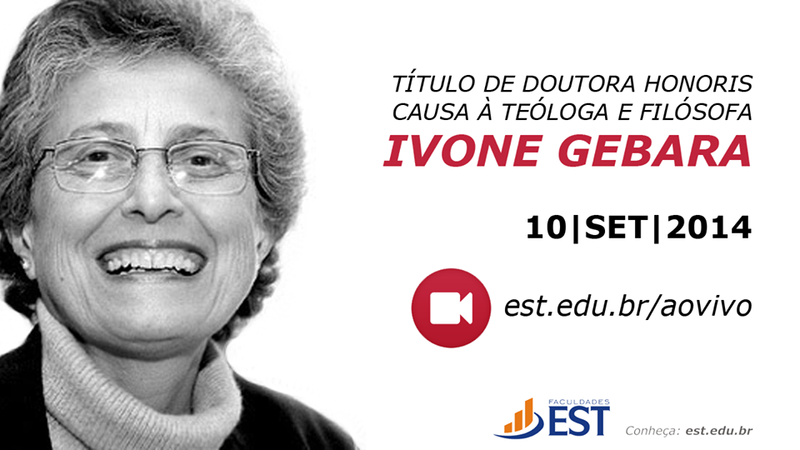 After more than 30 years of valuable contributions to the Brazilian and Latin American theological scene, theologian and philosopher Ivone Gebara will be awarded an honorary doctorate in absentia during the second International Congress on Religion, Media and Culture, held September 8 to 12 in São Leopoldo, Rio Grande do Sul, Brazil. The doctorate is an initiative by Núcleo de Pesquisa de Gênero das Faculdades EST – Escola Superior de Teologia de São Leopoldo (the Center for Gender Research Faculties and Superior School of Theology in São Leopoldo, Brazil). While Gebara will not be present to accept the award in person, she will be celebrated by a gathering of theologians, family and friends from around the world. The ceremony is a recognition of Gebara’s work and commitment to feminist and liberation theologies throughout her life. It is also a celebration of the many creative theological works by women all over Latin America. WATER applauds Ivone and all of our Latin American feminist colleagues in religion. Gebara is a Brazilian-born nun and member of the Congregation of the Sisters of Our Lady (Canoneses of St. Augustine). She holds a PhD in philosophy from the Catholic University of São Paulo and a PhD in religious studies from the Catholic University of Leuven (Belgium).